Bangladesh has a growing and dynamic economy. It has a vast potential to climb up and touch the peak of economic development. The geographical position of it is indeed a great advantage for the development. Both the agricultural and industrial sector can make this country developed and prosperous. Developing countries like Bangladesh need to depend on the export, remittance and foreign direct investment (FDI) most of the time. Foreign investment plays a key role to the growth of gross domestic product (GDP), hence very important to increase the consumption and the standard of life. To increase the consumption, for instance, to progress the economic development the country needs a lot of foreign investment. Investment increases the flow of money. It speeds the growth and development. But the country lacks adequate investment nowadays. It is easy to understand observing commercial banks in recent times. Lots of idle money in the banks describes the situation of less money circulation or less flow of money, thus, less investment. In Bangladesh, every directrix* of the financial development is negative or going down nowadays. This negative effect will create an ascendance on reserve, by lowering the reserve. Why this sudden downturn of the economy of Bangladesh? To answer this question, most of the economists claim the political instability. The fickleness in the international relations also has coordination with the ups and downs of foreign investment. It is easily predictable that the recent political unrest is liable for such critical and fragile economic backwardness. At this moment keeping the continuation of foreign investment is the biggest challenge for Bangladesh. Also keeping stable the interest of bank debt, bond issue and remittance stream is challenging. Since most of the developed countries are experiencing tardy growth in their economy and middle east countries also going through the political hazards. This resembles the challenge for a developing country which needs to depend mostly on foreign investment and aid. 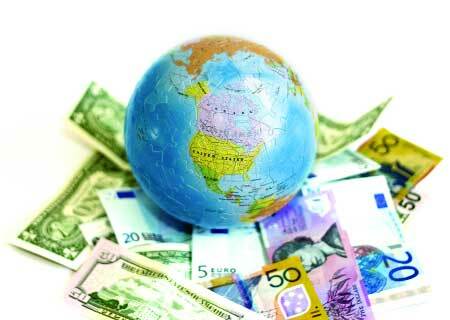 To maintain the growth, Bangladesh needs immediate action to increase the FDI. And to encourage the investors, interest rate of the debt should be brought down to single digit. The economy was in a stable condition and progress was satisfactory although the ongoing global economic downturn for the last few years. Again Bangladesh has been recognized internationally as a rising economic power; but it lags behind in many sectors till now. This fast growing potential economy is repeatedly getting stumble by the political violence and anarchy. Economists say, a country cannot reach its destination through such condition. They suggest, long term political amity with good governance is the basic need to destine economic development. The 2014 was a politically calm year compared to turbulent months of 2013 ahead of January 5 national election boycotted by BNP. After a peaceful year, the 2015 has begun with the display of violent politics as the two main parties continue to remain at combative. According to the report of Center for Policy Dialogue (CPD) published on. After increasing for three consecutive years, FDI has dwindled last year. Temporary estimates of Bangladesh Bank (BB) show FDI amounts $153 crore in 2014 whereas it was $160 crore in 2013. FDI decreased by 4.25 percent. According to the BB statistics, half of the total foreign investment came as a reinvestment to the multinational companies last year. 25 percent investment came through the inter-company loans. And the only 25 percent came as new investments. Local and foreign entrepreneurs have lost their interest to invest in the country due to the political upheaval and uncertainty. According to the Board of Investment (BOI) Bangladesh data, only one foreign direct investor got registered for investment in January this year. It amounts to BDT 50 crore compared to an average monthly registration of BDT 2500 crorethe last year. Even Local investors fear about the political situation could slump further. Such fear might have already sent a bad signal to foreign investors who were interested to invest in Bangladesh. BOI data shows foreign investments in 2014 were registered $3000m. According to the BOI, the real FDI was $1640m (BDT 13000 crore) in 2014. In the year, the re-investment, however, was $700m (BDT 5500 crore). BOI saw a moderate growth in FDI situation in 2014 although FDI in 2014 was not diversified. The setback we observed that a total of 30 firms – foreign, local and joint venture – registered with BOI in January this year. But of them, foreign firm was only one. According to news published in the Dhaka Tribune in the month of December last year, a total of BDT 3000 crore investment was registered. In January this year the figure came down to BDT 000 crore. In 2013, total volume of investment registered was $2,621m but the real investment was $1,599m. Industries Minister Amir Hossain Amu MP said that inflows of FDI into Bangladesh rose to a record high of 1.6 billion US dollars in 2014. This figure is expected to cross 2 billion US dollars in 2015. Amir Hossain Amu said Bangladesh is a vibrant economy that has, despite the recent global economic meltdown, maintained a consistent growth rate 6 percent plus. “We are keen on increasing FDI and we welcome more foreign direct investment in our booming industrial sectors like shipbuilding and ship recycling, infrastructure, communication, ICT, agriculture, textile, power, health and education and other prospective sectors.” He also said that the government has taken up an initiative to formulate National Industrial Policy-2015 recasting the previous one, focusing on growth competitiveness, reform and ease of doing business. “We have already made a draft of National Industrial Policy 2015 and it will be finalized soon after taking opinions from the stakeholders. We will expand policy support and incentive packages to the foreign investors under the guidelines of this new industrial policy,” said the veteran political leader. On the other hand, the cost of imports in the first five months (July to November) of the current fiscal year compared to the same period last year has increased. Abnormal rate of increase in the imports of varieties machinery of zero duty is observed. Imports of readymade garments (RMG) sector capital goods increased to several thousand percent. However, the growth in exports of RMG goods was very low in the last five months. So, question rises if the businessmen are related with money laundering. On this context, private research organization Center for Policy Dialogue (CPD) assessing the last one year states, there was no investment at all rather huge amounts of money have been smuggled out of the country. And it amounts more than foreign aid in taka. CPD worries if the smuggled money is coming back to the country as foreign investment and aid. Assembling the reasons behind the sterile foreign investment, we observe, though the cost of business is comparatively less in Dhaka, getting necessary plot for building industry-factory is nearly impossible. Though cheap workforce is available, the new connection of gas, electricity and water are quite impossible to get. Again, other cities have available plot for industries but requires environmental clearance and many other certificates. It wastes a lot of time. Therefore, Bangladesh is not getting expected foreign investment. Most of the FDI in South Asia flows towards India. In last three years, about 90 percent FDI of this region entered into India. And Bangladesh got about 3 to 3.5 percent only. On the other hand, 85 percent of the FDI stock (reserve) of South Asia is in the possession of India. Infrastructural leanness is the main hindrance as addressed so far. Furthermore, foreign investment is not increasing due to lack of investment friendly fair policy, bureaucratic perplexity, political instability and energy crisis. Again, the investors are being disappointed by the absence of any visible government initiative. There was no mentionable foreign investment in any sector without telecommunication in the last year. The reason is the government has not taken any positive steps to solve the problem although foreign investment is expected. Actually, government has failed to provide the needed benefit and policies to attract the foreign investment; results inan investment crisis. Frequent change in the policies is another obstruction to expected foreign investment. If the government wants to attract the foreign investors then it has to establish an investment friendly fair policy and ensure a stable political atmosphere, improvement of law and order and reinless supply of electricity. Foreign investment in the neighboring India and Myanmar is increasing day by day while investment is stagnated here in Bangladesh. Although many international renowned companies have shown interest to invest, are turning away for not getting necessary support. Mobile phone companySamsung had shown interest to build a factory here in Bangladesh nearly 4 years ago. They asked for a 2000 acre of land in the export processing zone but didn’t get it. Huge foreign investments get lost for not taking the right decision at the right time. Foreign Investors’ Chamber of Commerce and Industry (FICCI) president RupaliChowdhury laid emphasis on infrastructural developments and reducing bureaucratic hassles in a bid to woo foreign direct investment (FDI) in Bangladesh. “If we need to prioritize in terms short term improvement area, infrastructural development should be given the highest priority along with improvement in long, complicated bureaucratic process. Administrative barriers are quite longwinded and inter-related. Poor policy design and implementation, competitive weakness, structural impediments, low quality of infrastructure and skills, weak institutions, poor governance and administrative hassles represent the administrative barriers that discourage potential FDI. In Bangladesh, we are used to face barriers in different regulatory bodies in the form of their policy, legislation and functions,” FICCI president said at a meeting of the chamber at city hotel recently. Low-income people already have started to see the decline in their income. It will create negative effect on their consumption. While the production problem is happening, income of the people degrading, hence decreasing the demand of the product produced. As a result, farmers are affected in both two ways. The service sector and small and medium enterprises are being most affected due to ongoing political crisis. The production is being hampered. Income from the produced goods is lowering day by day. Again, those who are taking loan from the banks to stabilize the production are being defaulters. If such political crisis continues then new purchase orders will be hard to get. As a result, there will be negative effect on the next fiscal years. The investment situation was not good previously. And this situation will make it more sluggish. Particularly the transport sector is being hurt for a long term. New investment will be needed in this sector to cover up the losses. The solution must be ensured in a political way. The government can’t deny its responsibility. Businessmen should put pressure on the government to solve this crisis. It is high season for the winter crops. Remote area farmers emphasize on the sale and production of vegetables after the yield of Boro and Aman rice. They earn a lot from yielding vegetables. But from many days, they are unable to sell the yielded vegetables. In normal situation, thousands of truck-covered van runs, but now running in a rare number. They are taking huge fare also. Thus, the transportation of good, especially the transportation of raw materials is severely hampered. According to the Bangladesh Tourism Board and Bangladesh Tourism Corporation, the most favorable tourism season is from October to March. During this time, local and foreign tourists travel to the Cox’s Bazar, Chittagong Hill tracks of Bandarban, Rangamati and Khagrachhari, Kuakata, Sylhet, MoulaviBazar, Srimangal, Sundarban, NijhumDwip of Hatia, Monpura etc. But almost all the organizations involved in tourism business have canceled travel of the foreign tourists due to the ongoing strike-blockade. They are counting the huge loss. And again, the political turmoil is the only reason behind it. As the economy is facing a real trouble right now, a decent amount of investment is needed to stabilize economic condition. And the investment situation might not improve unless the two major parties reach a political consensus on the present crisis. Bangladesh is left with no other alternatives but to attract more FDI and boost and diversify exports. It is the government who should come forward to take all the initiatives to make the outside people interested about our economy to rise and the opportunity for the investors to invest in our country. National Board of Revenue (NBR) and Board of Investment (BOI) are two important agencies should work together to deal with the ongoing crisis. And Political leaders should try to make the political situation stable so that it helps the investors to make their investing decision at ease. *In mathematics, a directrix is a straight line associated to geometric object, such as, conic section, rational normal scroll and so forth.